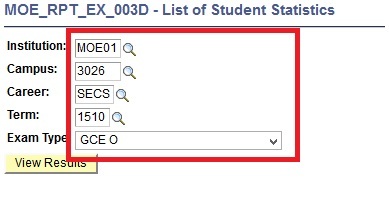 This function allows the users to view the number of student's issued with Statement of Entry Forms within the school. On the Search By field, enter information as given: 'MOE_RPT_EX_003D' and click Search Button. Select the Institution, Campus, Career, Term and Exam Type via lookup button.